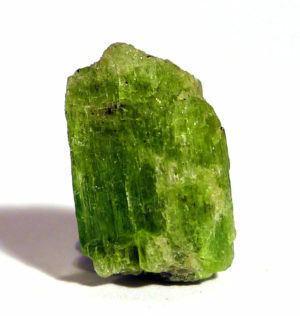 (The following is in reference to green tremolite): As with most green crystals, particularly of this brightness and clarity, tremolite is balancing and lifts the spirits. Although not necessarily a “happiness crystal”, it alleviates sadness and depression. It is also highly empowering, giving one a sense of inner strength as well as physical presence. The energy is directional, and tremolite can be used in a similar way to kyanite, holding it lengthwise in front of the body to draw in and centre Chi (life force), further fortifying our sense of presence and self. Green tremolite has a powerful effect on the heart, both the physical organ and the energy centre, making it an aid in healing heart conditions, and opening us to love and compassion. It has an additional influence on the upper heart chakra, stimulating the immune system to fight infection, so it is able to overcome diseases that impact on this system, such as ME and CFS, and teaches it discernment in the case of autoimmune diseases, in which the body does not recognise itself. Its balancing qualities aid clarity of mind and clear vision both physically and mentally. Tremolite forms a continuous solution series with actinolite, in which iron substitutes for magnesium, and is a product of thermal and regional metamorphism. The colour varies with iron content. Well-formed crystals are unusual, but are prismatic when they occur. More common are unterminated bladed crystals, radiating groups, or fibres. Fibres of both actinolite and tremolite are spun to make asbestos. Although we think of this as toxic, it is only dangerous if the fibres are inhaled, and prismatic or bladed crystals are safe to handle. 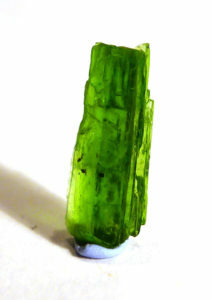 Tremolite is used to make asbestos. However, it is safe to handle, and only dangerous if fibres are inhaled. Named in 1789 by Johann Georg Albrecht Höpfner for the Tremola Valley (Val Tremola), Central St Gotthard Massif, Tessin, Switzerland, where the type material supposedly came from, according to the dealer from whom he had acquired the specimens. However, modern investigations of what is considered the type material, conserved at Geneva, revealed that the true type locality is Campolungo, Tessin. (Val Tremola which lies north of the isograd delineating the first appearance of tremolite). This mineral was earlier (1782) called Säulenspath and Sternspath by Johann Ehrenreich von Fichtel for material from Sebeşu de Jos, Transylvania, Romania (Roth, 2006). There are no healing traditions associated with this mineral.